I’ve just this morning dropped my son off at pre-school nursery. It was a big day for him, his first at the school where his big brother goes. For the first few days parents normally hang around a bit so the kids cab get used to the place, and the situation. Today I watched him flit about the tables. He would briefly pick something up, pronounce something to me or his mum, then move on. He was taking it all in. Getting the measure of the situation by touching, interpreting, and assimilating as many things as possible. He soon gravitated towards the ‘home corner’. Here he went deeper. The imaginative play became more prolonged. The scenarios became more thought-out. He made himself at home. The notion of ‘learning through play’ is widely discussed these days. It breeds confidence. The effort/reward dynamic is a productive one. We find new realms of activity we wouldn’t otherwise if we stuck to rigid rules. But in advertising we seem to discuss it largely in terms of brands and communications. The benefits of play are not something we formalise enough for ourselves very often. I think we could make more of the ‘play ethic‘ in our industry – defined as it is by creativity, learning about what’s possible, and assimilating new ways of doing things. Or if instead of ‘learning the ropes’, the beginning of our career was marked with a similar period of exploring the different corners of the business. Where we discovered what we were good at and what made us feel good. Where our imagination was the main criterion and we were judged on what unimagined opportunity we could invent. Not which existing mold we fitted best. When I went to the Bauhaus exhibition a few weeks ago I saw how a philosophical commitment to play can foster creativity exponentially. Looking back today through the notes I made, the theme of play and exploration clearly emerge. One tutor, Josef Albers, encouraged the approach of ‘purposeful play’. 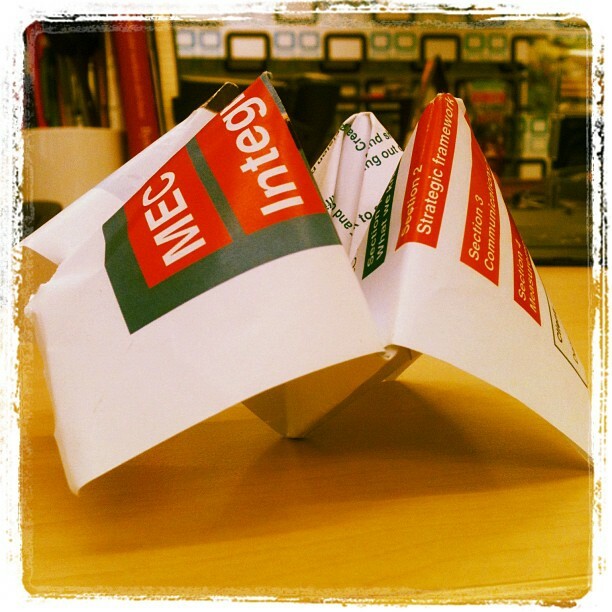 Students would be encouraged to experiment with simple materials to “explore their inherent functional and constructive possibilites without stated practical aims”. Understanding the different characteristics and qualities of wood, paper, fabric and glass developed wide-ranging creative skills that students could apply to their chosen vocation. Assignments often fused art and play. 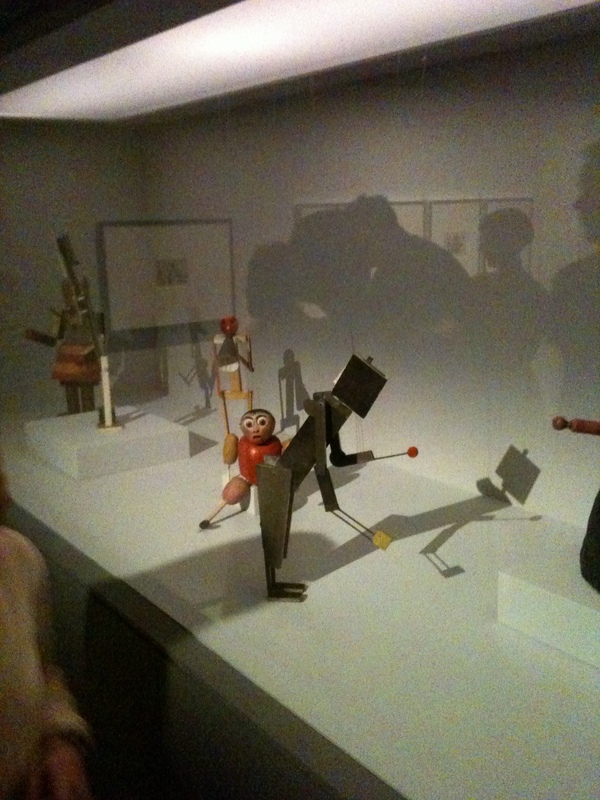 Many of the major artists who taught at the Bauhaus had children themselves, so one year the students produced toys like this. Ultimately this is about allowing people to tap into their creative imagination. Play lets us do that. The word that I remember most from the exhibit – one of those composite abstract nouns that only the Germans have – was Gesamtkunstwerk. It means ‘total art work’. You approach life as you would art. And vice versa. I think if we want advertising to remain an exciting, vibrant and creatively fulfilling realm in the future we need to encourage more of its proponents to think like this. Looking around me at work I see young professionals 15 years younger than me working and communicating largely with powerpoint (or keynote, of course). This depresses me, not because I’m anti-powerpoint (I know it’s unfashionable, but I actually think ppt has had an amazing democratising effect on people’s capability to express ideas in public). It depresses me because anything so widely used leads to homogenous results. It reflects badly on us. b) that way is exactly the same as every other sector in business. I’d like to think that as experts in communication we wouldn’t always default to the same mode. We have a world of different materials at our disposal. Appropriately enough, later in the morning we had a great discussion trying to articulate the way conversations spread between children and parents, between school and the home. Someone then made one of these.